Drive from Kampala towards the west and have a stop at the Equator for handicrafts and photos, then continue with the journey to Queen Elizabeth National Park by the magnificent Ruwenzori Mountain range. 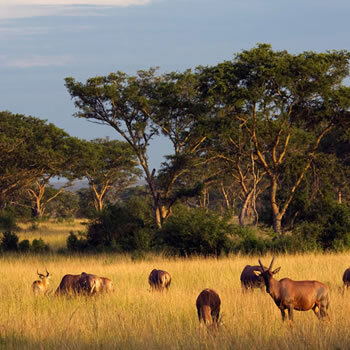 A game drive in Queen Elizabeth National Park will be highly rewarding for you will see animals including leopards, elephants, hogs, lions, buffaloes, duikers, hyenas, as well as many antelope species. A 2-hour boat cruise from Kazinga channel to Lake Edward is taken after lunch. The sail offers an opportunity to see the highest concentration of water submerged hippos at close range, surrounded by over 550 species of migrant and resident birds and crocodiles drinking and resting on the shores. The sail provides an excellent platform for photography, bird watching and game viewing. Then you will have dinner and an overnight stay at Mweya Safari Lodge or Budget Institute of ecology. Enjoy an early morning game drive along Kasenyi track and Queen’s mile in the park. Some of the animals you will see include Cape buffalo, elephants, topis, kobs, warthogs, waterbucks, hyenas, leopards, as well as lions and many birds. Following the game drive, take a trip to Bwindi via Maramagambo and Ishasha. Down the road to Ishasha your chances of seeing antelopes, waterbucks, kobs, elephants, and buffalo is very high. 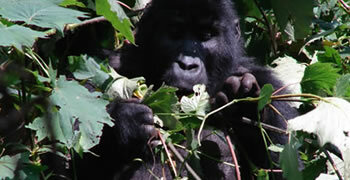 Once you get there you may rest at the exquisite Gorilla Forest Camp where you will dine and sleep. Day 3 - Gorilla Trekking Safari Bwindi Forest. After an early morning breakfast, you will enter into a wonderful rainforest, the gorilla's sanctuary, as it offers an exciting dense landscape characterized by the abundance of animals. You will get an opportunity to track them. The gorillas are the highlight of the park and the time spent looking for these beautiful primates vary according to their movements. Observing, photographing and spending time with these gentle, peaceful and shy apes is a unique, breath taking, inspiring, and thrilling lifetime memory adventure that will leave you desiring to have it again. The night will be spent at Buhoma homestead/Buhoma community Camp (FB) buta personal choice is not excluded. After breakfast return to Kampala via Mbarara. Lunch can be arranged for you but most of the time our clients enjoy traditional dishes on the way. On arrival in Kampala by 5.00 pm you will immediately start with the Kampala tour. Spend the night at the lodge which has a easy access to the airport.